The spirit of Grant Morrison's groundbreaking DOOM PATROL is captured in this debut series starring the cult-favorite misfits as a part of Gerard Way's new Young Animal imprint. Flex Mentallo, Robotman, Rebis, Crazy Jane, and more are back to twist minds and take control. This new take on a classic embraces and reimagines the Morrison run's signature surrealism and irreverence. 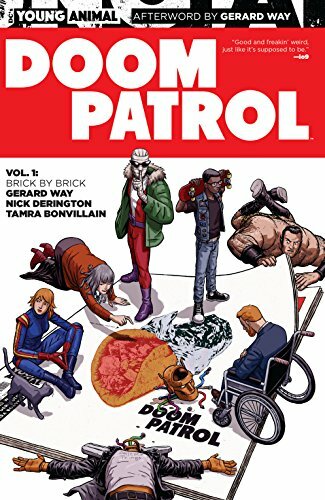 Incorporating bold, experimental art and a brash tone to match a new generation of readers, Gerard Way's DOOM PATROL establishes radical new beginnings, breaks new ground, and honors the warped team dynamic of the world's strangest heroes. This abstract and unexpected ensemble series nods at the Doom Patrol's roots by continuing to break the barriers of the traditional superhero genre. Collects issues #1-6. DOOM PATROL is the flagship title of Young Animal--a four-book grassroots mature reader imprint, creatively spearheaded by Gerard Way, bridging the gap between the DCU and Vertigo, and focusing on the juxtaposition between visual and thematic storytelling. Grant Morrison's run on Doom Patrol is widely regarded as the best the team has seen, and for good reason. His Doom Patrol is smart, weird, and entirely unique in comics. Of course, his run ended back in the nineties, and as all things go in comics, the team has shifted around a few times during the period following. In comes Way's run, seen here. 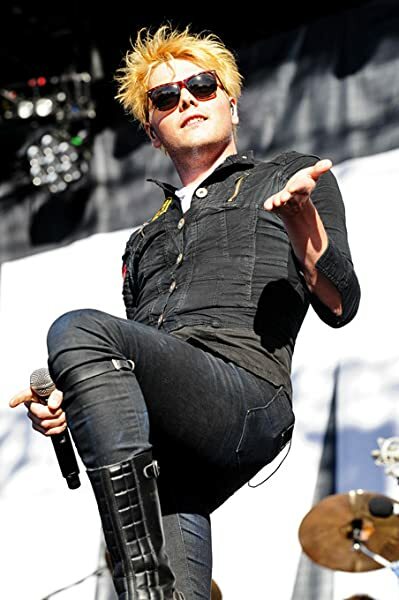 Gerard Way is, more or less, returning the team to a very Morrison-esque dynamic, although he shies away from outright copying the style. It works very well. Most of the team's lineup then gets returned by the end of this book, with Cliff, Negative Man, and Crazy Jane alongside classic supporting characters Danny the street and Flex Mentallo. Don't mistake this for a reboot, though; you will get the most out of this story if you understand the full context of Doom Patrol's background. You see, this book establishes Morrison's run, and more, as completely canon with the cosmic retcons that had previously put said runs out of continuity. In most series, this would be a severe case of continuity snarls, but with the already bizarre and metafictional basis Doom Patrol works with, it's clearly intentional, and that just adds to the appeal. And don't be mistaken; this book is bizarre. Most likely the weirdest book DC has put out in a long time. Once again, this is all done in-style of Morrison's earlier run. That being said, though, Way is not just carbon-copying Morrison; this book is still clearly his own spin. He introduces a few new characters, one of whom does get the most focus here, as well as depicting much more colorful and less bleak events than Morrison got at his darkest. None of this is bad, since it allows Way space to build his world up the way he wants to establish, although purist readers might be a tad more off-put. The one thing of note is that this has is that it hasn't quite reached the regular highs (quality, not drugs, for the record) of Morrison's work. Since it is still so early on here, I'm okay with that, as Way is clearly not finished here. The team line-up doesn't even come together until the last chapter of the book, and there are still questions left unanswered (what the absolute heck is Niles Caulder up to? ); whatever Way has in mind, he's obviously still working towards it. I definitely recommend picking this up to any Doom Patrol aficionado, and I can't wait to find out what happens next. Easily one of the weirdest and best new reads I have come across recently. DC's Young Animal imprint hits a home run with this new series based on the classic DC oddballs the Doom Patrol. An eclectic group of zany characters including Negative Man, Robotman, Space Case, and Danny (formerly the sentient street corner now the sentient ambulance), the Doom Patrol reforms when a group of aliens attempt to capture Danny the ambulance in order to harvest his pocket dimension for fresh meat. While Danny's driver, Space Case, recruits a team to save him from the aliens, Robotman helps Negative Man reclaim his lost powers. All in all though it is far from a traditional superhero story and a wonderfully weird and creative one at that. Newcomers to the series may be a bit lost at first but the series is well worth sticking with. The artwork is wonderful and gorgeous and Gerard Way is one hell of a creative lead. A must read for those who are looking for something a bit different from the Big Two. Great continuation of the doom patrol series. Especially great for fans of grant Morrison's run on the team.